Leftover Spaghetti Frittata is one of the best things in life! You can start with cold, cooked pasta out of your fridge or boil some just to make this fantastic dish! It’s great for picnics, lunches and brunches. Are there certain foods that symbolize summer for you? Maybe it’s tomatoes, blueberries, or homemade ice cream. For me, leftover spaghetti frittata is synonymous with summer picnics. 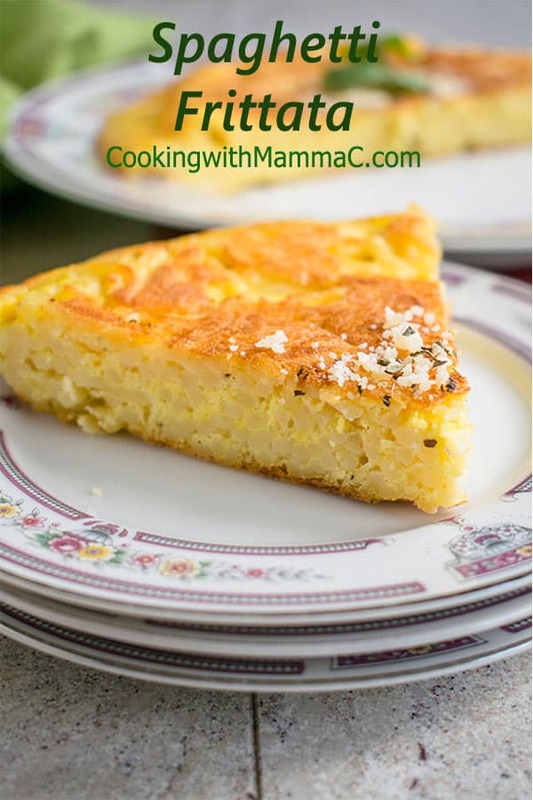 When I was a kid, our Italian brood would pack up fried chicken wings, battered zucchini, fresh fruit, a loaf of crusty bread, and this pasta frittata to spend the day swimming at a nearby lake or riding the coasters at Cedar Point. We needed food easy to grab and eat, no utensils required. As you might have guessed, peanut butter and jelly sandwiches weren’t on the menu. Italians need to cook for picnics. What feasts we enjoyed! But, hey, we ate off of paper plates, so we were roughing it. 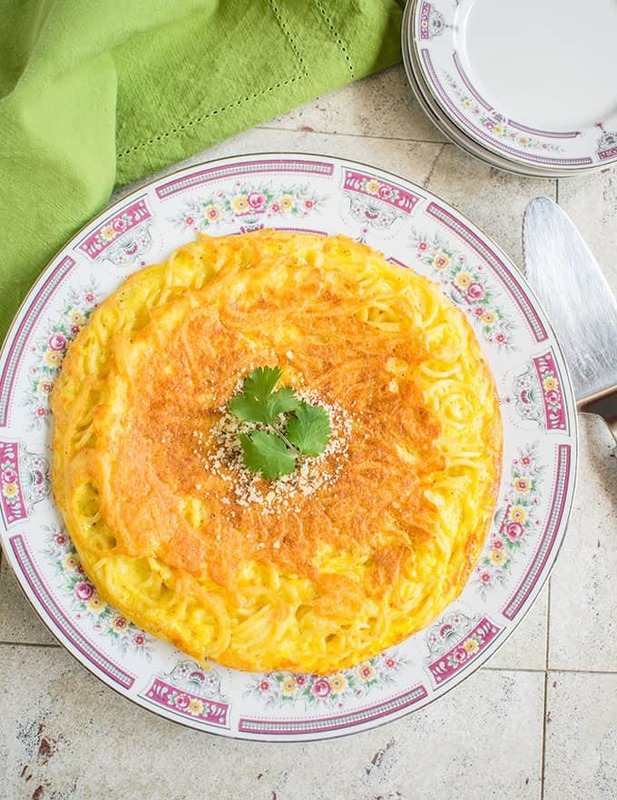 Actually, there’s an exquisite simplicity to this leftover spaghetti frittata. Like all the best Italian recipes, it includes a short list of ingredients with huge flavor. 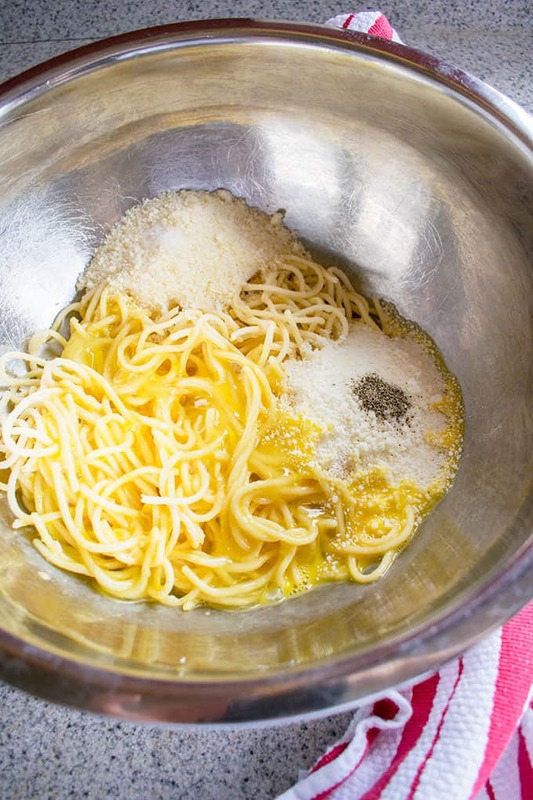 We’re talking spaghetti, eggs, Pecorino Romano, Parmesan and olive oil, plus salt and pepper. 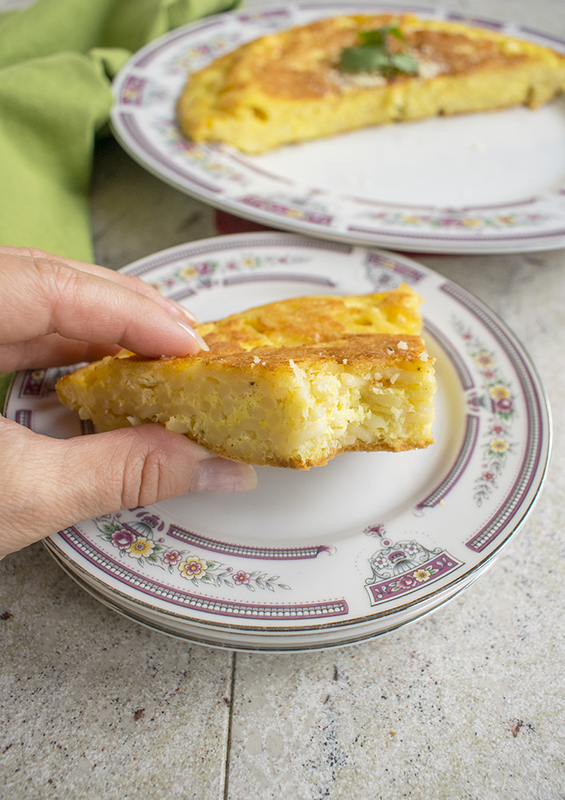 The best part of spaghetti frittata, as made in Naples, is the crispy top and bottom achieved by cooking the pasta pie on the stove. I promise, it’s not hard to flip your frittata. You’re just going to invert it onto a round platter when the time is right, then gently slide the frittata back into your pan to cook on the other side. I find it easier than flipping Mom’s Asparagus Frittata, probably because the spaghetti pie is more dense than delicate. Use a non-stick fry pan (affiliate link) plus a little olive oil in your pan, so your frittata won’t stick. Use medium-low heat to allow for longer cooking without burning. Don’t invert your frittata until you can see the underside is a deep, golden brown, and the edges are set. I cook the first side for 20 minutes on my gas stove. Invert your frittata onto a round platter while standing over the sink, in case there is any batter dripping. Gently slide the frittata back into your pan and allow the second side to get golden brown too. 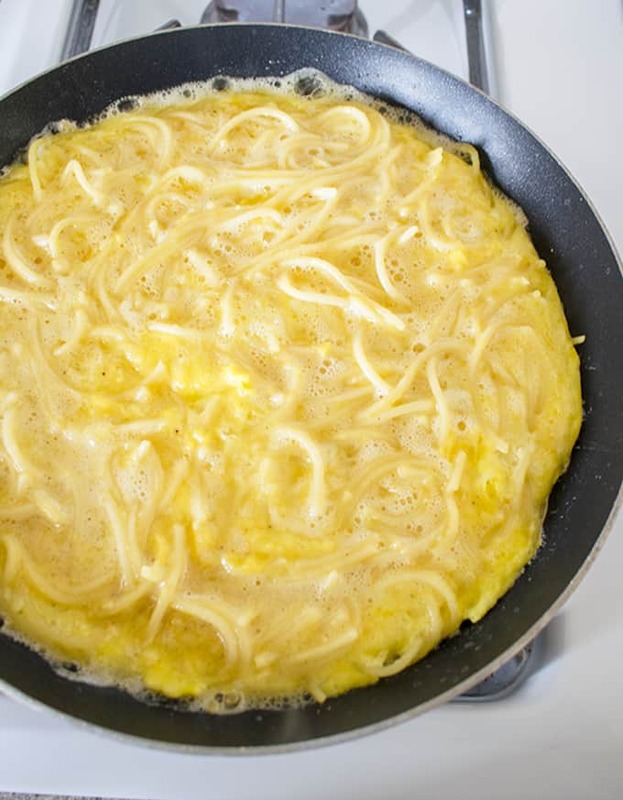 Spaghetti Frittata Variations – Still use the egg-and-cheese batter, but try these alternatives. Use leftover spaghetti mixed with marinara sauce. Use leftover linguine with pesto. That texture, though. A little crunchy on the outside (especially when still warm), and al dente on the inside. Friends, this leftover spaghetti frittata is one of the best things in life. Enjoy it warm, room temperature, or cold out of the fridge. Take it on picnics, pack it in lunches, or serve it at brunches. Oh, the places your frittata will go! Just save me a slice, okay? 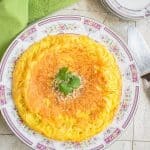 A delicious Leftover Spaghetti Frittata made on the stove as in Naples! Have a 10-inch, non-stick skillet ready on the stove (no heat yet), and a large, round platter next to the stove. Place your cooked spaghetti (cold out of the refrigerator is fine) into a large mixing bowl. Grate your cheeses, if needed, and add them to the bowl. In a liquid measuring cup, beat your eggs with a fork. Add the eggs to the mixing bowl. Add your salt and pepper to the bowl and stir everything with a fork to combine. Heat your skillet on the stove over medium-low heat. Add your olive oil to the pan and spread it around with a silicone spatula. Pour your spaghetti batter into the pan. Let the first side cook, uncovered, until the bottom of the frittata is deep, golden brown, and the edges are set. It could take around 20 minutes, depending on your stove. You can check it by using your spatula to gently lift up an edge and peak underneath. If your frittata seems like it will burn, lower the heat. When the first side is done, turn off the heat. Place your platter face-down over your pan. Carefully carry the pan and platter to your sink so you can invert the frittata over the sink. Invert the frittata by holding the platter in place with one hand while using your other hand to flip over the pan. The frittata will now be on your platter, cooked side up. Place your pan back on the stove. Gently slide the frittata into the skillet. Set the heat to medium low and let the other side of the frittata cook, uncovered, until golden brown. It could take around 10 minutes. Let the frittata rest for a few minutes before slicing it. Serve, warm, at room temperature, or even chilled. Store leftover frittata covered in the refrigerator, for up to four days. Pasta usually doubles in weight after it's cooked. If you're starting with leftover spaghetti, weigh it until you have about a pound. If you're starting with uncooked pasta, use 1/2 pound. Boil it in salted water, drain it, and mix 4 tablespoons of salted butter in it to prevent sticking. Then proceed with the frittata recipe. You can use leftover spaghetti that's been mixed with butter, marinara or pesto. If you have a smaller amount of pasta to work with, you can adjust the ingredients accordingly and use a smaller pan. The recipe as written also will work in a 12-inch skillet, but your frittata will be thinner. 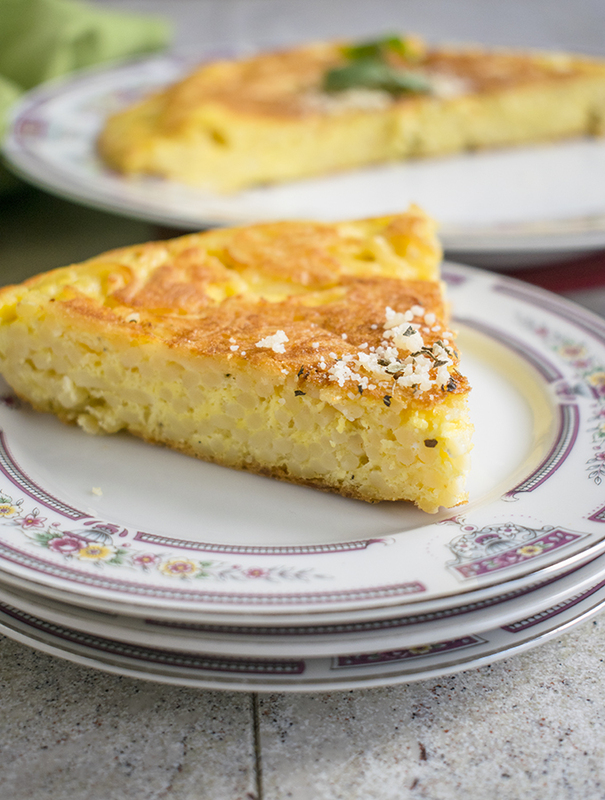 Hi Tina – I’m so glad you found my frittata recipe! Alfredo sauce would be fabulous here. I hope you explore my other recipes too! Oh my goodness! I thought only my family made this. My mother never wasted anything and on Monday (after pasta lunch on Sunday) we always had this. Only difference was that our spaghetti frittata was made with the pasta with sugo. And yes, there were no sandwiches for our picnics to the beach – lasagna and roast chicken. Glad to know a fellow Italian! Hi Marcellina – I love hearing that your family makes this too! I’m cracking up about the lasagna and roasted chicken at the beach. I’m definitely going to do this. What a fun dish for a summer day! I think you’d love it Tammy! Enjoy. This is just great! Many years ago, when I bought my first Lorenza de Medici cookbook, I noticed that she had a recipe for a frittata using leftover spaghetti. Except her spaghetti had a red sauce on it. And it worked! After learning that this was “acceptable,” I’ve been more creative with frittatas! And I guess she’s not the only Italian that did this! Oh, yes, there are almost no rules with the spaghetti frittata, except making it all on the stove for the crispiest results. Thanks, Mimi! What a great way to use up leftover spaghetti! Love that this recipe has such few (but super flavourful) ingredients to make it. The texture looks amazing! The texture is everything! And the taste too! Thanks, Marie. Innovative and tasty! My noodle loving toddler will totally approve! I’ve eaten this since I was little and loved it. Thanks, Britt! Sounds like a good way to use up leftover spaghetti and I can imagine good for a picnic as you say. Yes! And this is so good, it’s worth making the spaghetti at the last minute, if needed. WOW im SO pinning this!! I need to make this! I can’t stop eating it…enjoy! Thanks, Camila! Frittatas are one of my husbands favorites. I think adding spaghetti would be perfect for him. You are so right that a non-stick pan would work wonders. Your husband should definitely try this. Thanks, Ginny!